Evoma, near the Whitefield Post Office, is a great place to work for a few hours or the whole day, if you don’t have, or don’t need, a full-time office. 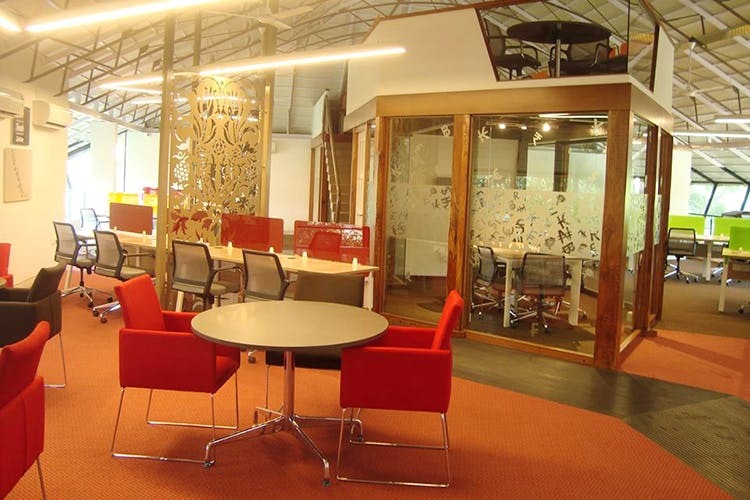 Freelancers, startups and businesses who need a temporary office space or meeting room. I spend a lot of time there. It’s very productive and professional. It’s especially great if you are a freelancer or start-up who can’t afford a full-time office in the city. Far better than working from your parents’ garage, I think! They have desks, couches, meeting rooms, telephone booths, a library/quiet zone, a business garden, and a cafe if you want to take a break. Rooftop cafe with a nice view. You won’t get bored of work because you can keep taking a break by looking over the tree tops.